Mystery Package when we reach 150 followers! Ok so I'm going to have my very first giveaway and it will be a biggie! This Mystery package will not disappoint! As soon as we reach 150 followers the fun will begin! Winning will be simple, you need to be a follower and leave a comment. I will announce when the contest starts, so keep checking back. Please let your friends know about Kricut Krazy and lets get it to 150 as soon as possible. 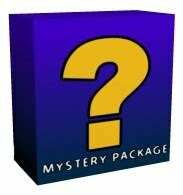 The Mystery pack will include Craft related items, cricut related items and things you will be happy to have! I'm following. New to your blog & love your projects.